Many of the parents in our program are having a hard tim finding work. The factories hire them for a one month trial. The workers are not paid anything during this time. At the end of the month, they are told they are not needed and the factory finds someone else. This way, the factories get free labor. It is very discouraging trying to find work when this goes on. There are some factories that do hire people but you never know what will happen after you have worked for one month with no pay. When the Christmas shipment arrives, boxes from sponsors are delivered. 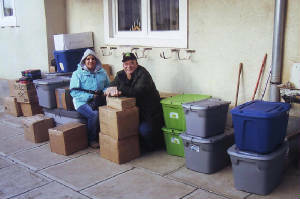 Families that don't have sponsors received boxes from Mission To Serve. For a lot of the kids in our program, the gifts we send are the only gifts they will receive. 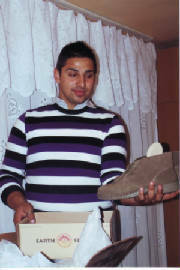 New shoes and new winter coats were distributed. 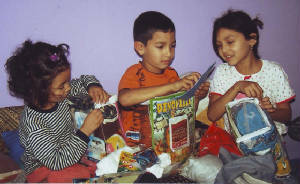 Some families received food boxes from their sponsors or Mission To Serve. Thank you to all our sponsors that make this ministry possible. 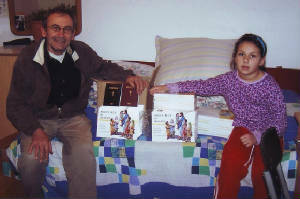 Several sponsors donated for adult and children's Bibles in the Romanian language that were given to Pastor Cuc and the new church in southern Romania. The ministry of MISSION TO SERVE ministers to Handicapped, Hurting and Helpless children and families with Material Aid and Gospel Literature. Our goal is to BRING HOPE IN THE MIDST OF DESPAIR! A BIG PROBLEM that is continuing to exist among the gypsy people is the kidnapping of young girls from the schools or streets. Men come from other villages and take girls between the ages of 12-18. Most of the girls stop going to school at the age of 12 because of this fear. They stay close to their home and are even afraid to go on the streets. 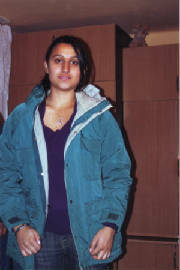 We found many of the girls in our program had been kidnapped a few months ago. One of the families got their daughter back. Adina Marin had been taken by an older man to his village. He was mean and so were his parents. Adina is a good Christian girl and tried to share the gospel but they wanted nothing to do with it. They made her stay on her knees begging like a dog and beat her constantly. Her parents did not know where she was but they continued to pray for her return. Adina was able to escape and found her way home to her parents and 8 siblings.